Hey folks, introducing you with another news of the week and this time it's all about the smartphone flagship killer OnePlus, which is going to launch it's smart 4K TV by the next year. OnePlus, a brand named for it's smart phones which is just killing all other mobile phone companies at the price tag in which they are providing specs for the phones but now they turned to make a smart TV for the home entertainment. On Sep 16, Pete Lau, Founder and CEO of OnePlus, tweeted "Excited to take the next step forward together! What would you like to see in the OnePlus TV? " In the 5 year journey of OnePlus it has introduced us with 8 Flagship smartphones and had constantly exploring other technology, and now they have announced launching their smart 4K TV which they call 'OnePlus TV' which will be in market by the mid of 2019. "We want to bring the home environment to the next level of intelligent connectivity. ", Pete Lau mentioned in their OnePlus Forum. They are building a premium, with a flagship design their OnePlus TV. They are focusing more one Audio and Video quality which is the main feature of any TV and mentioned to provide a Home Connectivity experience form their smart 4K TV, the OnePlus TV. A Flagship designed TV will be coming soon to fit best into your Home Entertainment. The OnePlus TV will bring premium quality experience and just like OnePlus smartphones you need not to worry for buying any other TV for straight 5 years because it will provide 5 years of updates for it's OnePlus TV. Launching with flagship design, Lau said that OnePlus TV is going to emphasize more on audio and video quality experience and it will come with AI Support. The AI Support for OnePlus TV may be taken from a third party, google assistant or amazon alexa. It may be possible they introduce their own AI Support for their smart TV. An inbuilt camera will be leaded to enhance it's AI experience for authentication and for the video chat. They are more concern with the home privacy with their upcoming TV. We actually don't know how they going to make home privacy more secure as it's a new topic to introduced in television world. As the flagship is set for their smartphone similarly they will provide their OnePlus TV on that set price range with the LED 4K display. The operating system is most probably going to be none other than Android. A special microphone is provided to control your TV from anywhere in the range. 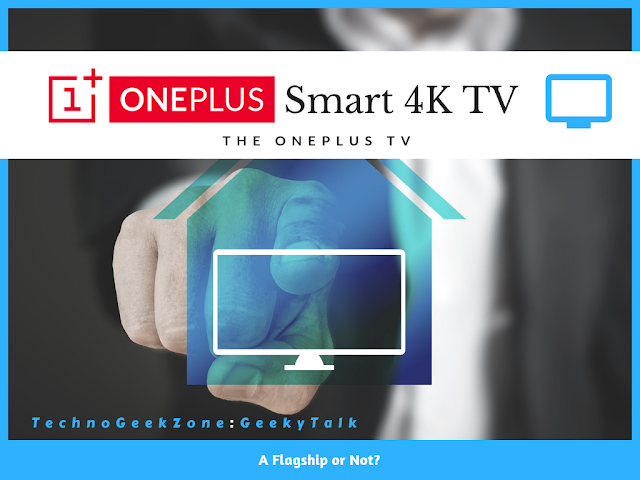 OnePlus's CEO, Lau has tweeted the news of launching it's OnePlus TV but it is not officially announced by OnePlus that they are launching any TV so stay tuned to TechnoGeekZone for upcoming news of OnePlus TV. This is a huge step in the OnePlus journey, but like each step along the way, one that we have taken with intense consideration and deliberation. There is great challenge in pushing new boundaries in technology and innovation, but even greater fulfillment in meeting people around the world impacted by our products every day. Here’s to taking the next step together. Although every comment is appreciated, Keep in mind that any link or keyword in the comments may be the reason for deletion of your comment. Thanks for understanding!